Mumbai (Bombay) is known for museums, historic sites, scenic drive, shopping, and nature. Your plan includes some of its best attractions: browse the exhibits of Gateway of India, contemplate the long history of Chhatrapati Shivaji Terminus, wander the streets of Chowpatty Beach, and indulge in some culinary diversions at a local gastronomic tour. For reviews, traveler tips, where to stay, and other tourist information, you can read our Mumbai (Bombay) itinerary planner. Houston, USA to Mumbai (Bombay) is an approximately 22-hour flight. Traveling from Houston to Mumbai (Bombay), you'll lose 11 hours due to the time zone difference. Traveling from Houston in December, you will find days in Mumbai (Bombay) are warmer (90°F), and nights are a bit warmer (66°F). Finish up your sightseeing early on the 28th (Thu) so you can travel to Kochi (Cochin). Take a break from Kochi (Cochin) with a short trip to Marari Beach in Mararikulam, about 1h 15 min away. And it doesn't end there: make a trip to Chinese Fishing Nets, take a stroll through Jew Town, take in the spiritual surroundings of Church of Saint Francis, and admire the landmark architecture of Santa Cruz Basilica. To find photos, where to stay, and tourist information, read our Kochi (Cochin) trip itinerary builder. You can fly from Mumbai (Bombay) to Kochi (Cochin) in 3 hours. Alternatively, you can drive; or take a train. Traveling from Mumbai (Bombay) in December, expect a bit warmer with lows of 74°F in Kochi (Cochin). Wrap up your sightseeing on the 1st (Mon) to allow time to travel to Udaipur. On the 1st (Mon), look for gifts at Gothwal Art and then explore the activities along Lake Fatehsagar Udaipur. To see more things to do, ratings, reviews, and tourist information, read our Udaipur custom trip planner. Fly from Kochi (Cochin) to Udaipur in 5.5 hours. Alternatively, you can drive; or do a combination of train and bus. Cap off your sightseeing on the 3rd (Wed) early enough to travel to Jaipur. Spend the 5th (Fri) wandering through the wild on a nature and wildlife tour. The adventure continues: step into the grandiose world of Amber Fort, steep yourself in history at Royal Gaitor Tumbas, see the sky in a new way at Jantar Mantar - Jaipur, and look for gifts at Akee International. To find traveler tips, ratings, maps, and tourist information, use the Jaipur itinerary planner. Traveling by flight from Udaipur to Jaipur takes 1.5 hours. Alternatively, you can drive; or take a train. In January, plan for daily highs up to 72°F, and evening lows to 47°F. Wrap up your sightseeing on the 7th (Sun) early enough to drive to Agra. Change things up with a short trip to Keoladeo National Park in Bharatpur (about 1h 20 min away). And it doesn't end there: make a trip to Taj Mahal, admire the landmark architecture of Jahangir Mahal, steep yourself in history at Shah Burj, and step into the grandiose world of Agra Fort. To find photos, maps, where to stay, and more tourist information, use the Agra itinerary planner. You can drive from Jaipur to Agra in 3.5 hours. Other options are to take a train; or do a combination of flight and train. Traveling from Jaipur in January, expect nights in Agra to be about the same, around 45°F, while days are little chillier, around 66°F. Finish up your sightseeing early on the 10th (Wed) so you can go by car to New Delhi. New Delhi is known for historic sites, parks, shopping, museums, and fun & games. 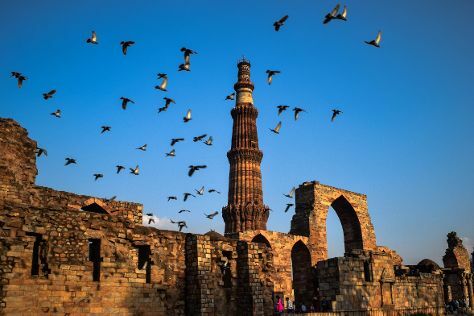 Your plan includes some of its best attractions: take in nature's colorful creations at Humayun's Tomb, contemplate in the serene atmosphere at Gurudwara Bangla Sahib, step into the grandiose world of Red Fort (Lal Quila), and take in panoramic vistas at Qutub Minar. To see traveler tips, other places to visit, where to stay, and tourist information, read New Delhi itinerary maker. Traveling by car from Agra to New Delhi takes 3 hours. Alternatively, you can take a train. In January, daytime highs in New Delhi are 67°F, while nighttime lows are 46°F. Wrap up your sightseeing by early afternoon on the 13th (Sat) to allow enough time to travel back home.